In the magnificent Waldolf Hilton, London, there was the first “China House” for the Summer Olympics. On the evening of August 9, the China House was bathed in bright lights and a festive atmosphere. Many distinguished guests were present and everyone looks happy. On a big screen the scenes of the victories achieved by the Chinese sports delegation at the London Olympics were played repeatedly, and the displayed podium wear of Chinese athletes is full of the signatures of the medalists. Over 100 guests, including the diplomats from the Chinese Embassy and the representatives from the Chinese-funded institutions, Chinese language media, overseas students and Chinese compatriots, were eagerly waiting for their heroes. Here, the victory party hosted by the Chinese Embassy for the Chinese sports delegation was about to begin. 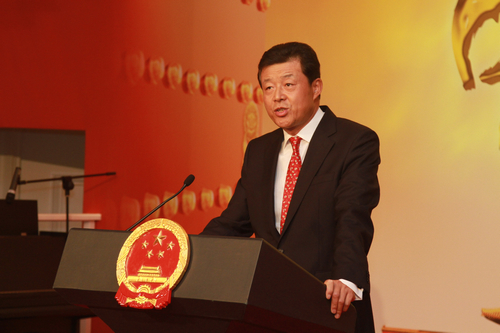 Ambassador Liu Xiaoming first delivered a speech. He congratulated the whole Chinese Olympic Corps for their heroic exploits. He said, “You demonstrated the exceptional athletic standards of China. In the 13 days since opening of the Games, we have been overwhelmed by the stunning performance of the Chinese delegation. You won the very first gold medal and the first new world record; then China’s first Olympic gold medals in men’s swimming and men’s foil; also all five gold medals in badminton and once again all four medals in table tennis. …All these successes reflect the formidable competing capabilities of Chinese athletes. They also won great credit for China and the Chinese nation. My colleagues and I went to many of the events to cheer Chinese athletes and witnessed numerous historic moments. I have to say that you have made us profoundly proud. You have not only won gold, silver and bronze medals, but also created Olympic heroes and enhanced the prestige of China. 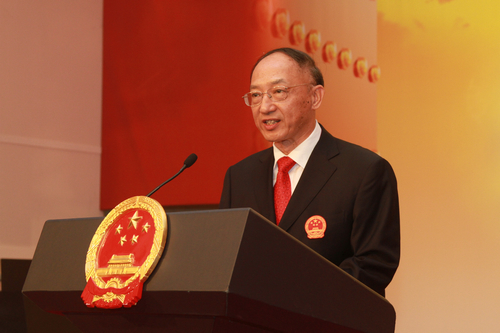 Ambassador Liu stressed that “all of you displayed true sportsmanship and Olympic spirit. Chinese athletes gritted their teeth and stiffened their sinews to fulfill the Olympic motto of faster, higher and stronger. The way you handled the intense spotlight and pressure is also what I greatly admired. For example, the 16-year old prodigy swimmer, Ye Shiwen, confronted doubts with composure and proved herself in the pool. Weightlifter Lu Haojie fought through despite his injury. He won a silver medal with a successful lift of 190 kg in the clean and jerk. That silver meant much more than gold as his bravery and perseverance won over the support of the entire audience. 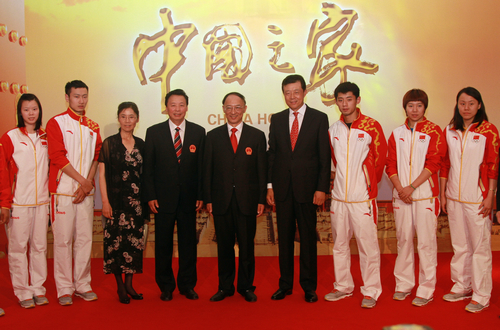 Ambassador Liu finally wished the athletes a safe journey home and greater success in the future. 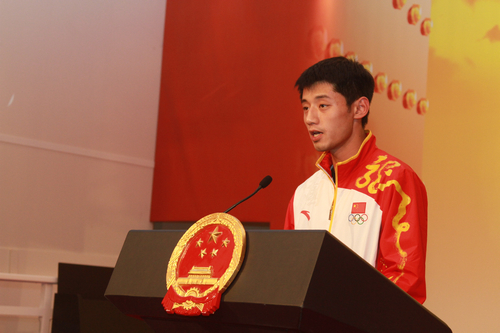 Olympic champion Zhang Jike delivered a speech on behalf of the athletes. He said, “This is my first Olympic Games. Before I left home, my leaders, coaches and the fellow athletes who have attended the Olympic Games warned me about the toughness and difficulties of competing abroad. But they did not tell me that we can feel at home abroad, with all the enthusiastic encouragement and considerate helps. During our stay in Britain, we personally experienced the intense and exciting Olympic competitions. And the convenience and safety here made us feel at home.” He thanked the Embassy and the Chinese compatriots for their strong support and hope everyone would enjoy the beauty of Olympics and sports together with the athletes. Among all the guests, a silver-haired senior is particularly eye catching. 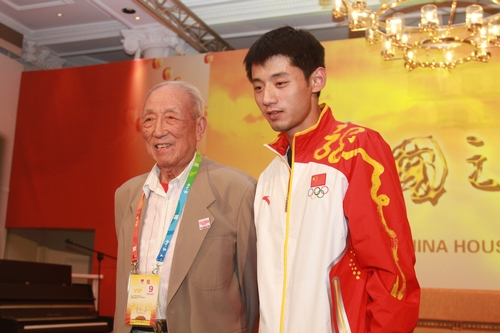 He was the 88-year-old Mr. Wu Chengzhang, a former basketball player. Mr. Wu played on behalf of China in the 1948 Olympic Games in London. The government of old China in 1948 could not even afford the traveling expenses of the Chinese team. After more than 60 years, Mr. Wu satisfactorily went back in London, where he shed sweat and tears, at the second Olympic Games hosted by the city. 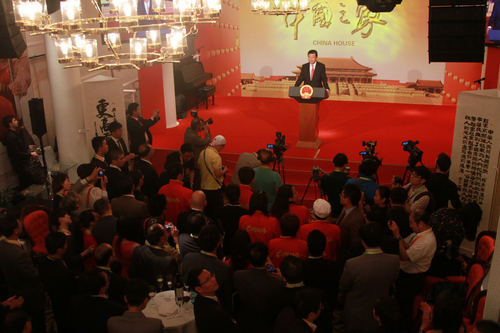 At the invitation of Ambassador Liu, he enthusiastically attended the victory party. When presenting Mr. Wu to other guests, Ambassador Liu said, “The glory of our Chinese Olympic athletes echoes the growth of China. A growing China has offered a platform never seen before for Chinese athletes to pursue their Olympic dreams. I am sure that back in London this time, Mr. Wu must be immensely proud of the current opportunities for the Chinese athletes and today’s China. 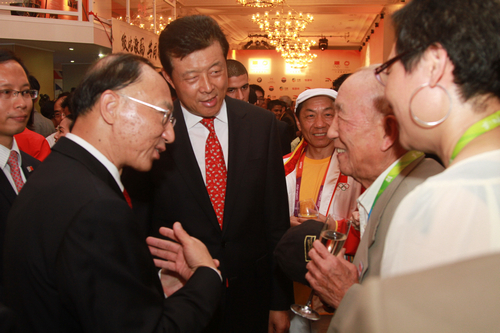 Mr. Wu told President Liu Peng, Ambassador Liu and the athletes with feeling that as a member of the older generation of athletes, he hoped but could not win glory for the motherland. Only 2 of the 45 members of the Chinese delegation to the 1948 London Olympic Games are still alive. He was pleased to see the excellent young Chinese winning honour for China at the London Olympics and thanked the young athletes for helping them to achieve their long-cherished wish. With these remarks Mr. Wu deeply bowed to the athletes present. The young athletes tightly held Mr. Wu’s hands to express their respects. The presenting Chinese compatriots and students eagerly asked the athletes for signatures and posed for pictures with them. They said that when abroad, they more deeply realize the value of a powerful motherland and more concretely feel the amiability of the compatriots. From the “weak country with no sports” in the past to today’s great achievements, the comparison of the two London Olympic Games gives them more confidence to hold their heads high even far away from the motherland. The indomitable spirit and exceptional standard of the Chinese athletes impressed the world, and also inspired the patriotism of the overseas Chinese. They sincerely thanked the Chinese athletes for their hard work, wished the athletes greater achievements and their motherland more prosperity. 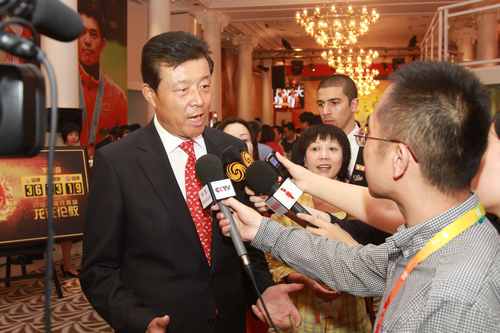 Ambassador Liu also carefully prepared an extra surprise for the athletes and guests. Another shining star went onto the stage. She was the famous singer Lv Wei, who went to Britain from her “Embracing the Melody of Olympics” concert. 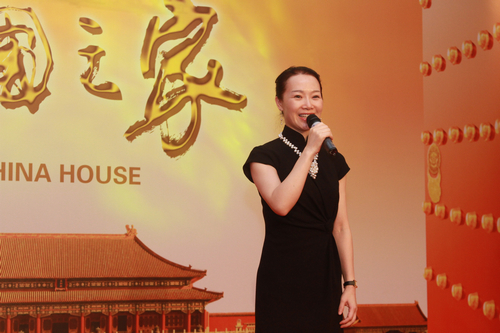 At the invitation of Ambassador Liu, she attended the victory party to entertain the guests and encourage the athletes. The “Jasmine” full of Chinese flavor aroused homesickness among the guests and drawing a burst of applause. After that, two young Chinese-British performers played the cheerful and agile “Csardas Hungarian Dance” with flute and piano. The prodigy singer Huang Jiaqi, who held the “Lighting the World” concert in London, cooperated with the British genius Declan in singing well-known Chinese and British songs. The performance continuously heated the atmosphere of the party. At about 8 p.m., when the party was close to the end, a bigger surprise embraced everyone in the China House. Chen Ruolin won the gold medal with a wide lead in the women’s 10m diving final. This was the 37th gold medal for the Chinese Olympic delegation and China’s 200th gold medal in the Summer Olympics. The victory party came to a perfect end with the most enthusiastic applause and cheers.